A suicide bomber drove a car into a Libyan National Army (LNA) checkpoint to the west of Nufliya today killing four security force members. LNA spokesman Colonel Ahmed Mismari initially said that two policemen from Sirte had died but it was later learnt that two LNA soldiers had also perished. The attack was later claimed by the so-called Islamic State (IS). This was the second recent deadly IS assault against the LNA. Eight days ago a large terrorist force overran a checkpoint in the Jufra district, executing nine captured members of Battalion 131 and also killing two civilian truck drivers who happened to be passing by. Earlier this week, Mismari said there had been “a massive mobilisation” of IS forces around and to the west of Sirte. 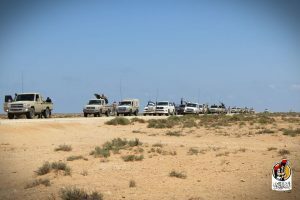 He claimed that the terrorists’ next destination would be the Gulf of Sirte to attempt to seize control of the ports and oil installations, followed by a move towards Benghazi and Derna. Mismari also predicted another IS mobilisation to the west of Jufra with the objective of attacking the base in Jufra and from there fanning out into the entire central region. 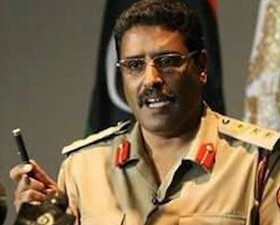 In response, Mismari said that the LNA would send troops to surround the terrorists in the Jufra region. “Chadian mercenaries coordinating with the Saraya Benghazi (Benghazi Defence Brigades) rebels and militias from Misrata will be spearheading the offensive against the terrorists,” Mismari said. The Bunyan Marsous (BM) operations room also warned of IS regrouping in the Sirte area. Today it said it had sent a large column south of Sirte on a routine anti-terrorist patrol. More than a score of vehicles had patrolled desert and checked ravines for signs of IS terrorists. They have been reported south of the town and, according to one unconfirmed report, even to have returned to parts of Sirte itself. In March this year as the LNA finally overran the Benghazi district of Ganfouda, a suicide bomber botched an attempt to drive an explosives-laden car into another checkpoint at Nufliya. The vehicle overturned before it could teach its target, the driver was captured and engineers later defused the bomb.